To Samuel Chalfant, it seemed that his nemesis, Josiah Bacon. had pursued him since the day he graduated from dental school. He abandoned his first practice in Wilmington, Delaware in 1873 rather than pay the 45-year-old businessman the tribute demanded. Two years later, his dental office in St. Louis came to an equally ignominious end, crushed by a welter of claims and injunctions filed by Bacon. And now Bacon was in San Francisco, loudly threatening to finish him once and for all. The burly 35-year-old dentist later told the San Francisco police that he realized he had lost. The time had come to make peace. As he walked over to Bacon’s hotel room on that Easter Sunday morning, 1879, he planned on nothing other than complete and utter capitulation. He still considered Bacon’s claims to be unjust and unreasonable, if not actually illegal. But Chalfant was willing to pay him the tribute he demanded so he return to being a plain and simple dentist. As for the gun he was carrying in his pocket, well, he had his reasons. Bacon was staying at the Baldwin Hotel, a posh hostelry on Market Street at the foot of Powell Street. Chalfant knocked at the door of Bacon’s third floor suite shortly after 9 AM. Bacon opened the door and frostily invited him in. Chalfant bitterly recalled, “He didn’t show me the courtesy one gentleman would expect of another. He did not ask me to take a seat...” Bacon turned his back from Chalfant and continued his preparations for church. As he stood in front of the mirror adjusting his cravat, Chalfant leaned against a chair and began to plead his case. The barely civil atmosphere evaporated almost immediately. According to Chalfant’s statement, Bacon quickly took on a “hard and harsh manner” and “became overbearing...” Threats and accusations were exchanged. Bacon turned from the mirror and strode across the room to the dentist. Undeterred by the dentist’s greater height and size, he looked him in the eye and informed him in no uncertain terms that payment was no longer an option. He was going to make an example out of him. He would stop at nothing short of seeing Chalfant in prison. As Bacon’s torrent of threats continued, Chalfant reached into his pocket and pulled out his pistol. He told the police he only did it “...in order to command his (Bacon’s) respect.” It didn’t work at first. Bacon only laughed defiantly and derisively at the distraught dentist shakily extending the gun. But his laughter quickly faded when he saw the fevered look in Chalfant’s eyes. Was respect, or at least an invitation to sit down and discuss this like gentlemen in the offing? Alas, Chalfant never found out, for his gun did as guns brandished before one’s adversaries inevitably do. The sound of a shot filled the room. Chalfant insisted he had no intention of shooting Bacon; his gun, described in the newspapers as a “self-cocker” went off “accidentally” as he leaned his gun-hand against the chair. But like so many accidental shots, it was guided by the sure hand of Providence. The bullet hit Bacon just above the waist. With an astonished look on his face, Bacon said, “Oh don’t” and fell to the floor. Somehow, he managed to struggle back to his feet, only to quickly again collapse—for good. Although Chalfant tried to render aid, it was too late. Bacon was dead. Chalfant recalled his terror at this unexpected turn of events. He expected mobs of people attracted by the thunder of the shot to burst through the door at any moment. The dazed dentist went into the bedroom of the suite and sat on the bed, meekly awaiting capture. One minute passed. Then five minutes, ten. There was no running footsteps or excited voices or even a knock at the door. Befuddled, Chalfant stepped out into the hall. It was empty—everyone on the floor was down at breakfast. Pocketing his pistol, he slipped out of the hotel via a back staircase. In his haste, he left the room door ajar. As the morning wore on, a few passersby noticed the partially dressed man lying sprawled on the floor. They thought little of it. No blood was visible, so to the casual observer, Bacon looked like just another Sunday morning sufferer from Saturday night “over intoxication”—a not unusual sight even in the finest San Francisco hotel on Easter Sunday. It wasn’t until noon that a chambermaid entered the room to clean and discovered that Bacon was dead. The papers played up the “Baldwin Hotel Mystery.” Breathless reporters saw in the killing the handiwork of “the Thugs of India or those planned by La Mafia,” and built the murder up into a mystery worthy of Sherlock Holmes. But down at police headquarters, detectives were pretty certain just what sort of person would want to do away with Josiah Bacon. The immediately began to check every train and steamer leaving San Francisco for decamping dentists. It was all about dentures, or more precisely, a patent on dentures. Bacon was the treasurer of the Goodyear Dental Vulcanite Company, holders of the patent on making dental plates from a hard rubber known as “Vulcanite.” (The teeth themselves continued to be made out of ceramic). He headed the Vulcanite Co.’s massively unpopular (at least among dentists!) campaign to collect license fees and royalties from dentists making dentures from Vulcanite, which happened to be almost every dentist in the country. And almost to a man, they hated him for it. “Vulcanite” rubber was originally patented by Charles Goodyear in 1851, with an improved process patented by his brother Nelson in 1858. “Vulcanite” was firm and durable, yet resilient material. Among its many applications, one of the most lucrative was dental prosthetics. Not only were denture plates made from Vulcanite 50 percent lighter and 80 percent cheaper than traditional gold and silver models, a properly made set sealed easily and tightly to the patients’ gums. Suction, not awkward retaining springs, held them in place. They fit better, felt more comfortable, and looked more realistic. Wearers could speak, smile, and even eat with a flair previously reserved for those with full sets of natural teeth. Vulcanite revolutionized dentistry. No longer were dentures the last resort of the rich. Now the common man could have his never-brushed, never-flossed aching and rotting teeth extracted almost painlessly (thanks to nitrous oxide, another recent innovation) and replaced with reasonable facsimiles for less than the price of a good suit. Dentists were so besieged with patients clamoring for teeth that “don’t hurt” that dental journals fretted about the profession being reduced to mere denture-fitting, since it was so much easier to pull and replace a tooth than to treat it. And they had a point. The Vulcanite Company’s claim was based on “The Cummings Patent.” It was a patent from nowhere, brandished by an obscure claimant whose primary merit was not ingenuity or inventiveness, but being first in line at the Patent Office with a completed application making a vague claim. This is a time honored tradition in American patent law that continues to spawn massive patent litigation today in the high-tech field. The “inventor” in this case was Dr. John Cummings, an obscure Boston dentist who apparently never invented anything. 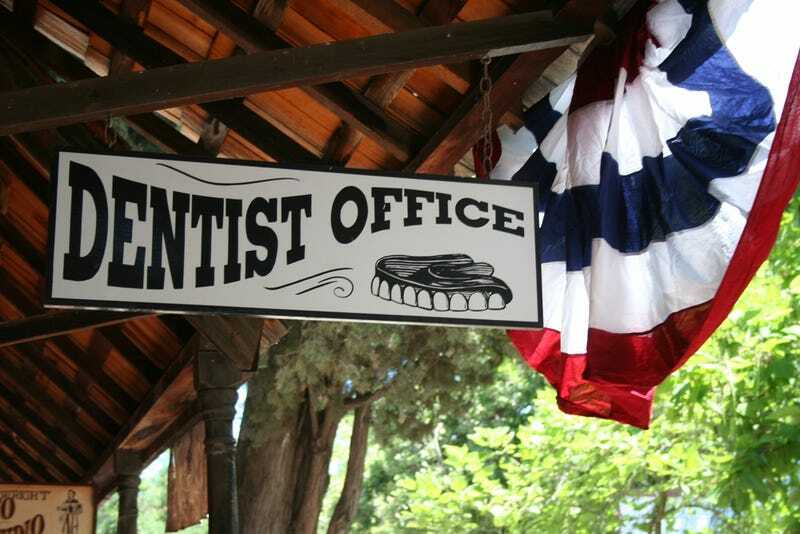 He notified the Patent Office in 1852 of his intent to patent rubber dentures. His full application was denied in 1855, partly because rubber dentures were already in widespread use—in fact, they had been patented in England (not by Cummings!) in 1848. But Cummings persisted, probably with Bacon’s backing. He filed three more claims and was rejected twice more before inexplicably receiving a patent in 1864. Bacon quickly arranged for Cummings to transfer “his” patent to the Vulcanite Company. Somehow, Bacon managed to rig the deal so he received all the company’s proceeds from the patent personally. Bacon now had the means and the motivation to launch his lucrative reign of terror over the dental profession. For the next 13 years, Bacon crisscrossed the country in pursuit of dentists infringing on the Vulcanite dental patent. He employed an impressive arsenal of dirty tricks to ensnare any hapless tooth-puller trying to make rubber dentures on the Q.T.. He had spies in every city. Neighbors and suppliers were questioned, assistants bribed, sting operations established. If these failed, according to the New York Times, “Intimidation was often resorted to.” He seemed to relish nothing more than hauling a deadbeat dentist into court and personally cross-examining the poor fellow. Bacon stopped at nothing to try to obtain his royalties. He even went after dentists using processes not covered by his patent, albeit unsuccessfully. The man seemed to enjoy his job entirely too much. His campaign had the dentists up in arms. Dental historian Dr. Malvin Ring called it “one of the most severe persecutions the dental profession had ever endured.” The trade journals ranted and raved. Legal defense funds were set up, and the battles raged in courts across the country. And invariably, the dentists lost. Bacon did, after all, did have a patent. A case was finally appealed to the Supreme Court in 1872. The Court dismissed it, upholding the lower court’s ruling on the validity of the Cummings patent. It seemed like the dentists had come to the end of the road and had no choice but submission. But S.S. White, publisher of a dental trade journal, was suspicious. The appeal had been hastily filed and half-heartedly pursued. He began to dig around and uncovered Bacon’s grandest scheme. Not only had Bacon been running his (the plaintiff’s) side of the case, he had been heavily involved on the defendant’s side, financing the appeal and employing counsel for both sides. This is no way to run a lawsuit. You can bet that the dentists’ attorney was under strict orders to save his best stuff for another day. When this came to light, hope for deliverance from Bacon’s depredations sprung anew. For the first time in history, the Supreme Court reversed itself. The door was opened for a second appeal. A case was carefully chosen: solid, representative, and crystal clear. The dentists doggedly appealed it through the lower courts, losing each step of the way. Finally, the Supreme Court heard the case in 1877. And the dentists lost again, this time fair and square. Rightly or wrongly, the Cummings patent was valid and Bacon and the Vulcanite Company could charge they saw fit from the dentists for the life of the patent. A victorious Bacon threw himself into his campaign with renewed zeal, traveling the country coast to coast to whip the still-numerous recalcitrant dentists in line. On one hand, it is easy to sympathize with the dentists. They weren’t paying royalties in tribute to brilliant innovation, but extortion as part of a sharply executed scheme. But, on the other hand, they had LOST. Shady or not, it was the law. For all the high-minded rhetoric, the dentists weren’t giving all those rubber dentures away. If the dental associations had employed Bacon to pursue those DDS-less blackguards, “unscrupulous, unqualified vampires” in the words of a dental journal, who undercut real dentists on denture prices, they would have canonized him. The time had come to pay up and shut up. After leaving the hotel, Chalfant later said he had but one thought: to turn himself in. He walked up Kearny Street to the police station in the old City Hall. No dice; it was closed on Sundays. He left the building and headed down Montgomery Street looking for a policeman to surrender to. Naturally, there wasn’t one in sight. At California Street, he ran into a man wearing a blue uniform. Unfortunately, he was a custom house inspector or some other such type who couldn’t arrest anyone. The undoubtedly puzzled fellow assured Chalfant, though, that if he just kept going he’d surely run into a policeman sooner or later. Chalfant wound up walking clear down to the waterfront. He strolled out onto a wharf and sat down on a pile of lumber. He remained there until dusk being, he said, “utterly prostrated by the occurrence of the morning.” He then turned around and walked back up Third Street. At the corner of Mission Street, he saw a “Rooms for Let” sign. He went inside and took a room in the cheap boarding house, went upstairs, and collapsed into bed. H was so overcome with fever and guilt, he didn’t set foot outside his door for the next two days. His only contact with the outside world was on Tuesday, when the landlady brought him some tea. Early Wednesday morning, with the entire city looking for him, Chalfant got up and dragged himself to the Central Police Station. He walked in at 6:00 AM and took a seat on the bench, a tired, bedraggled figure apparently asleep. When a policeman asked him who he was, he admitted he was Samuel Chalfant and asked to see Captain Lees, the officer in charge of the investigation. Lees noted Chalfant’s fevered appearance and quickly gave him some quinine, and then had him taken out for a shave and breakfast. Thus restored, Chalfant returned to the police station and made a voluntary statement “with tears running down his cheeks,” Lees later testified. Lees was struck by Chalfant’s sincere manner and willingness to take entire blame for the “accident;” a confabulator, Lees said, would have surely claimed Bacon had come at him with the chair or something. Unfortunately, the jury at Chalfant’s trial the following year was less credulous. Chalfant was defended by Hall McAllister, then San Francisco’s pre-eminent attorney. But even the eloquent McAllister could do little more than parade character witnesses attesting to Chalfant’s non-homicidal nature and argue that his client’s inept execution was indicative of an accident. The prosecution, on the other hand, painted a damning picture of the accused marching into the room of his mortal enemy with a loaded pistol in his pocket. Many thought Chalfant was lucky to get off with only 10 years at San Quentin on a charge of second degree murder. Light sentence or not, Chalfant took it hard. Not that he had it that bad on the inside for a convict. Instead of endless hours making burlap sacks at San Quentin’s new jute mill, he enjoyed the cushy job of prison dentist. His office was outside prison walls. Except for striped convict trousers, he could wear civilian clothes and even collect fees from non-convict patients. He enjoyed broad support. Friends (and, no doubt, his fellow dentists) on the outside campaigned heavily for his pardon. One especially tireless petitioner on his behalf, Mrs. Eunice Parker paid him regular visits, bearing tea, sympathy and freshly laundered clothes. On September 2, 1883, Mrs. Parker brought Chalfant his usual package of clean laundry. Although she later denied it, there may have been one or two pieces of contraband tucked in between the clean shirts. Chalfant never admitted where the goods came from, only coyly saying, “You could say I found it.” But among the visiting day crowd hurrying to catch the 2:00 PM boat from San Quentin Village to San Francisco was a man in false whiskers and a fresh pair of un-striped trousers, his pockets heavy with money and pistols. Almost before his absence was noticed, Chalfant was safely ensconced on an Ogden-bound Overland Express train. If he had made it to Utah, Chalfant swore he would have never been caught so perfectly was his identity concealed. But alas, he was done in by a peach. Juice from his snack loosened the gum holding his beard just enough to rouse a railroad detective’s suspicions. Chalfant never got past Winnemucca. His escape attracted considerable attention back in San Francisco. Reporters lined up to interview him when he spent the night at the city jail en route to San Quentin. One paper described him as worn out from the stress of traveling, but still surprisingly upbeat; another said he was a pitiable figure, with the toll of his prison-acquired morphine habit plainly written on his features and in his bearing. Whether Chalfant was nodding his sentence away with the help of opiates is questionable. But he certainly was in a bit of a “state” that night in San Francisco. Sometime that evening, Mrs. Parker arranged to have him removed from his cell and taken to the chambers of Judge Ferral so they could be married. Chalfant appeared to be in a daze. The judge took one look at him and refused to perform the ceremony. Chalfant would later say that he was in a mental fog during this episode and had no idea marriage was in the offing. When he found out about his narrow escape from matrimony, he wrote Mrs. Parker and asked her to burn the marriage license. Chalfant was pardoned in 1885 after serving less than six years of his sentence. He returned to San Francisco and resumed his dental practice. He practiced profitably and peacefully, eventually taking his nephew into partnership a few years before he finally retired in 1904. Even though his office for several years was only a block away from the scene of his crime, San Francisco was more than willing to forget. A directory of prominent local businessmen issued in the 1890s devotes half a page to Chalfant, and goes into considerable detail about his education and Civil War Service without the least mention of rubber dentures or the Vulcanite Co.
Chalfant’s last brush with notoriety came a year after his release. His erstwhile champion and self-appointed fiancée Mrs. Parker was in trouble. She had been arrested and jailed for her habit of storing items belonging to the lodgers at her boarding house in local pawn shops. The papers remembered how she had tirelessly championed Chalfant when he was in prison. Now, in her hour of need, they sarcastically noted that Chalfant was no where to be seen. Chalfant seemed content with his subsequent obscurity. Yet the blow he struck for his profession was not in vain. Bacon’s death marked the end of the Vulcanite Company’s campaign to enforce their patent. They stopped collecting fees after his murder, and let the patent lapse in 1881—perhaps because none of their employees was willing to be shot by another enraged dentist. Chalfant had said he always believed that when a man lost his teeth, a dentist had a right to put them in without asking permission of, or making payment to anybody. And, thanks to his efforts, they now did. Not that they remembered him for it. Today, Chalfant is virtually unknown. Only hard-core dental historians and San Francisco murder buffs with eclectic tastes know the story of the man who made the world safe for rubber dentures. Heck, most people don’t even remember rubber dentures. Acrylic resins have long since supplanted rubber as the material of choice for dental plates. But while the teacher is forgotten, the lesson was not. As dentist and historian Marvin Ring notes, “The dental profession learned from its bitter experience in the Vulcanite controversy, and never again would it allow itself to be milked by profiteering patent holders.” When many years later a bunch of sharpies tried to put a similar scheme into action to collect royalties on gold crowns, the dental associations stopped it without firing a shot. The dentists aren’t about to be taken again. John Marr is the former editor of the zine Murder Can Be Fun. Further information here and here. This article originally appeared in Murder Can Be Fun and has been republished with permission.